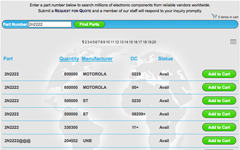 Your customers will be able to search from over 60 million line-items from vendors you select worldwide and easily send RFQs through your website. Completely branded to match the look and feel of your website. 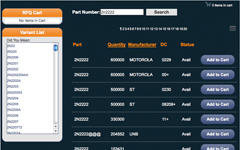 Add line-items to the shopping cart to easily submit an RFQ. 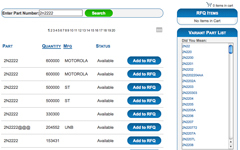 View details for each item in the search results, including images and part information. 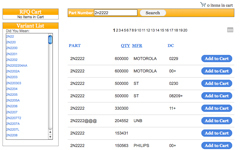 Generates a list of similar part numbers based on the current search. Configured to match your website's design. You have total control of what inventory your customers can search. Give us a call to have our design team show you how easy it can be.